Hi friends. I want to wish all of you a very Merry Christmas and a Happy New Year! Today I’m sharing the holiday card that I’ve sent out to my family and friends. Each year I make one design which I mass produce. This works best for me. Since I LOVE the holiday Plaid Ribbons from Really Reasonable Ribbon, that is what I’ve used this year. 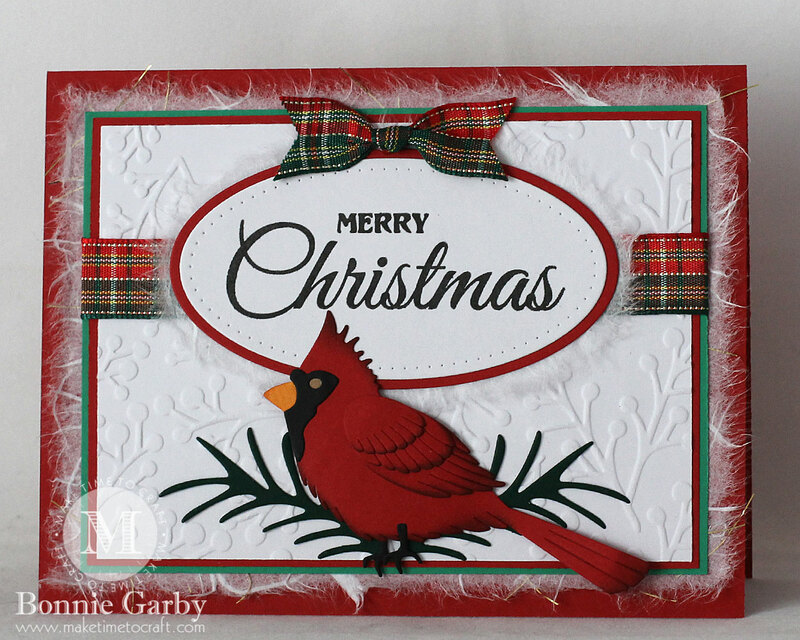 I decided to go with traditional Christmas colors for my card and I LOVE cardinals, so this is what I came up with. I ran a strip of Plaid Christmas Red/Green/Gold Ribbon across the middle of the card under the sentiment. I also could not resist a layer of white mulberry paper under my layers. In order to keep things flat for mailing, rather than a bow I simply took a piece of ribbon, tied a knot in the middle and then dove-tailed the ribbon ends. This is a flat enough embellishment for mailing in a regular envelope with no additional postage. Bonnie this is so gorgeous! 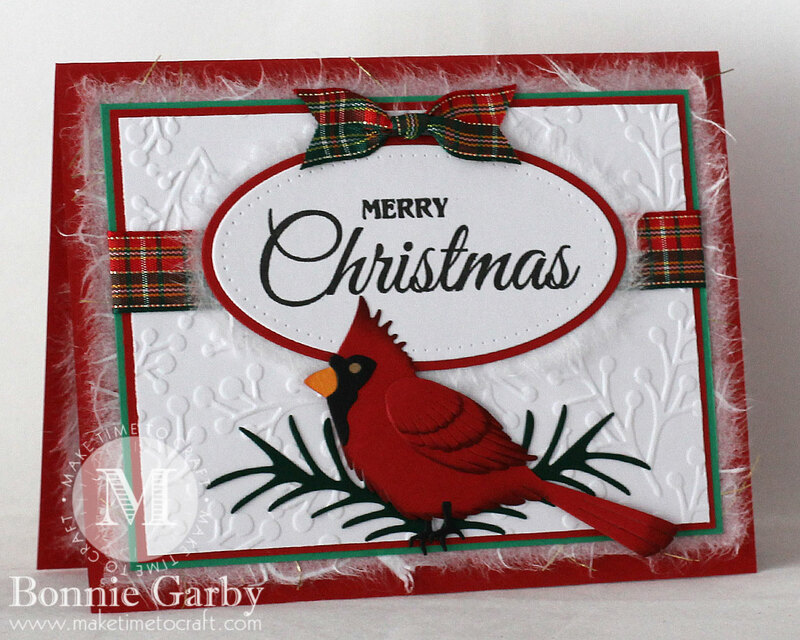 I love all the festive colors and that is a great cardinal die you used. Lovely Christmas Card and the mulberry paper fits perfectly. It looks like a nest ! Thanks for joining our Christmas Challenge @ Little Red Wagon and i hope to see you back again soon. Merry Christmas ! Beautiful card and beautifully designed!! Thank you for joining our challenge at Dies R Us! Gorgeous as always Bonnie! I love cardinals and this one is beautiful!! Thanks so much for playing in our ‘Christmas’ challenge at Dies R Us. Good Luck and please come back again soon! I love your design. The strong red and the pop of plaid are fantastic. Gorgeous! I love the soft look of your matting. Beautiful cardinal and card. Love the traditional colors and pretty ribbon. Thanks for sharing with us at Dies R Us Challenge Blog. We hope you will join us for future challenges. I absolutely LOVE the red cardinal. This is stunning, Bonnie. So festive and sweet. You are one talented gal! My love and prayers for you in 2019 and always. You are a true blessing in my life. This is such a vibrant card! 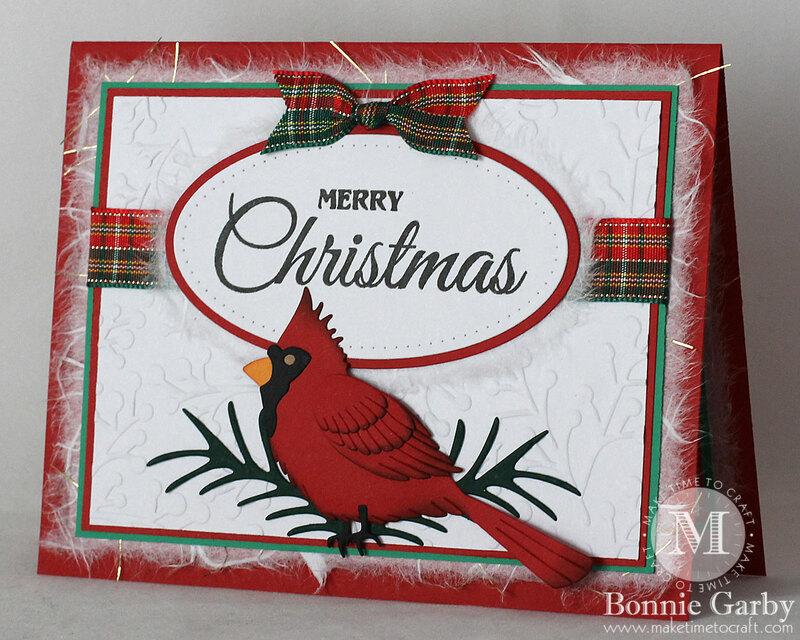 Love the plaid ribbon and the embossing adds great texture along with the mulberry paper. I just wanted to say that I think your card is beautiful. I love how your plaids on the paper and ribbon match so well. The mulberry paper was a great detail! I have been using more vellum lately than ever before. I think I would like to try some mulberry paper. It looks like it added great texture to your card. I found your card on the post for the Crafty Gals Corner next challenge where they also announced the winners from the previous challenge. It is easy to see why it was chosen as a Top Three by the design team. Congratulations! Thanks so much Marianne. I just discovered I was in the top 3 – how exciting!! 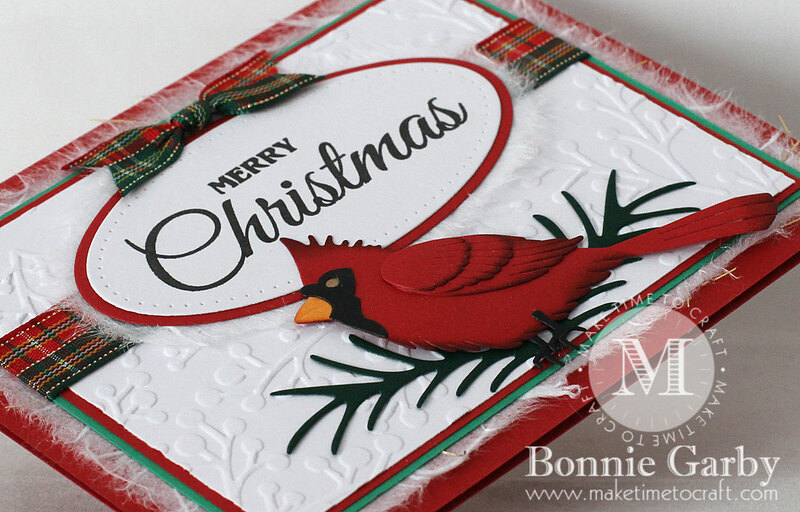 I’m so glad you liked my card enough to stop by my blog for a visit. I hope you’ll come back soon. I love mulberry paper and have used it for years. If you want to see where I get mine and how I use it, I have a video up on YouTube here: https://www.youtube.com/watch?v=lCIFlRxTzPY&t=2s Happy crafting! !